Book Business Ads in Indian Newspapers Instantly Online! Why Book Business Ad in Newspapers? When you publish your business ad in a newspaper of your choice, the response you get for it depends on how successful you are in composing the classified newspaper advertisement. Business Display ads can also be referred as Personalised Business Ads as they can be refined and enhanced to attract the specific target audience. How to Book Business Advertisement In Newspapers? ReleaseMyAd enables you to book your newspaper Business Classified Text advertisement in three basic steps. Selection of the preferred ad category like Business Ads and classified advertising for sub categories like Business Offers, Business Proposals, Agents has been integrated into the online booking system of releaseMyAd. Any advertiser can now view the business rate card and then place his classified text advert in a newspaper of his choice, at the lowest of costs instantly! The next most important step in your ad booking process is the composition of your ad. ReleaseMyAd enables you to take the help of enhancements to increase the prominence of your ad. You can see how your ad will look like when published, through our Live Preview Ad Feature. Finally you can confirm your ad release dates & clear payments via our secure payment mediums. Our payment options include online payment mediums like Credit/Debit Cards & Net Banking & offline payments mediums like Demand Drafts, Cheque deposits & Cash Collection from your home or office. It is important to clear all payments to receive an instant email confirmation with all your booking details, at least before 3 days of your ad release date. Business Classified Text Ads are straightforward and perfect for small and specific business requirements and services. These ads are mostly preferred by individuals or small enterprises and even for legal business requirements like Business Proposals or Business Offers. The selection of the ad type, takes you to Business Ad Category selection which in turn takes you to the Compose Ad tab where you can design your own display classified ad. In case of Display Classified Business Ads you can customize them & emphasize on your requirement in your own way. Different design templates, colours, image & logo uploading options & text formatting have been collated into the online booking system of releaseMyAd to help you augment the appeal of your ad. Our Live Ad Preview Feature enables you to take a good look at the ad you are about to publish. Lastly you can confirm your ad release dates & clear payments via our secure payment mediums. Business CD ads can be personalised with the use of logos, images, colored backgrounds etc. These ads can be customized according to your choices and published your preferred newspaper. Q. I want to book ads in local newspapers for my business. Can you tell me how to book an ad? Q. I own a stationary store chain in Patna. I have a new outlet of my store opening up near P&M mall, for which I wish to create some buzz. Can anyone tell me how I can make my campaign a success? Q. Hi, I own a hosiery store chain in Lucknow that specializes in Chikan embroidery. I have recently opened up a second branch of my store nearby, for which I wish to publish a few display ads in Lucknow’s newspapers. What is the fastest way to book ads in Lucknow? Q. We are a waste management company operating in Mumbai. We want to advertise in newspapers for brand awareness. Kindly provide us with the rates and details. 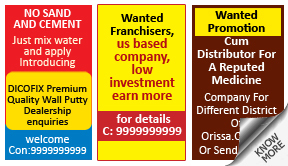 Q. I want to advertise about my home-made chocolate services display classified ad in Hindustan Times Kolkata edition. Which newspaper advertising agency can provide me the rates for booking the same ad? Q. I want to book an ad about my newly opened restaurant in Nagpur. 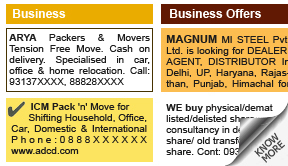 Please suggest the best newspaper advertising agency which can help me to book the same.